Dmitry Tcheglakov (1970) graduated from Moscow State as a cellist. At the conservatoire was taught by Alexander Fedorchenko, Natalie Shahovskaya, Dmitry Miller. He also studied composition in the professor Albert Leman's class. 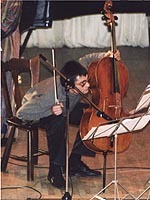 Laureate of the International Chamber Music Contest in Kazale-Monserato (1992). Member of Theremin-Center since 1994. Author of several (including electroacoustic) compositions: "The rust"; "Cis, or conversation about madhouse"; "Es - stylization and melodeclamation"; "Saraband - 2000". One of the founders and participants of rock- group "Mutant". Co-author of several rock-compositions. Permanent participant of international musical festivals "Alternative", "Moscow Autumn". Took part in Theremin-Center's program at "Moscow - Berlin" festival. Scholar of Darmstadt's Courses of New Music as a cellist (attended by Zigfrid Palm) and a composer. Took part in "Passions - 2000" project as a composer and a performer. Performed compositions by Albert Leman, Tigran Mansuryan, Giya Kanchely and Boris Tischenko. Permanently cooperates with composers Iraida Yusupova, Vladimir Nikolayev, Tatyana Miheyeva, Sergey Goloobkov, Inna Zjvanetskaya, Pavel Karmanov, Yevgeniy Seleznyov, Julia Dmitryukova and also with modern dancer Oleg Suliymenko (Sayra-blansh theater). Permanent participant of group "Ad Hoc".